Discuss the details of the retrofit and reroofing market, its size, and the different roofing types. Differentiate between the advantages and risks of retrofit and reroofing, and pinpoint key design considerations for these projects. Identify the energy-generating and saving options available with metal roofing projects. 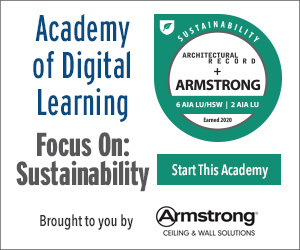 Describe best-practice insights for metal wall retrofits. Review helpful metal roofing and cladding renovations. Long-lasting and durable with a great aesthetic, metal roof and cladding systems are a popular choice for today’s commercial and industrial buildings. While these products are in demand for new building projects, the lion’s share of activity is taking place in the retrofit market. 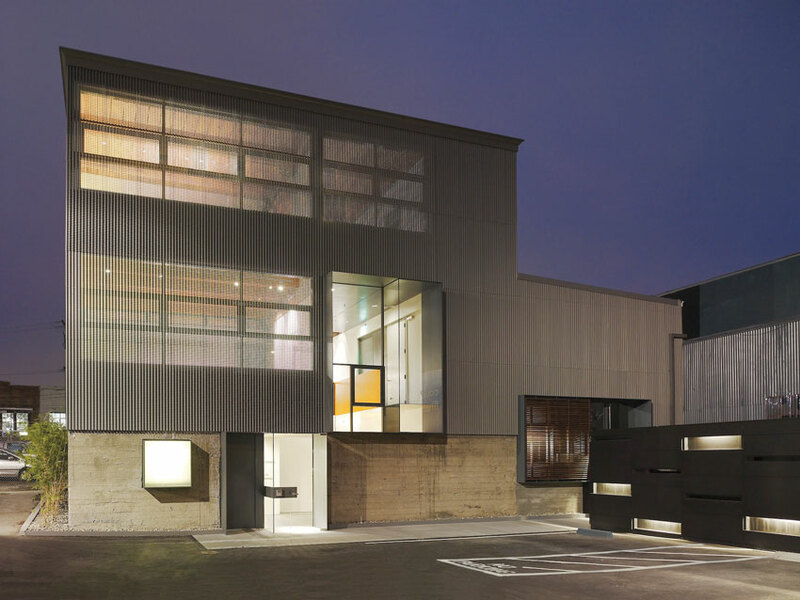 A perforated and corrugated zinc retrofit envelope helped transform an industrial, turn-of-the-century building—once a bottle-storage facility for an adjacent brewery—into a prime example of innovative sustainable, adaptive reuse at 355 11th Street in San Francisco. Let’s start with some terminology: What is the difference between retrofiting a roof and reroofing a roof? Retrofitting is the installation of new roofing materials over existing roofing materials without removal of the original material. Reroofing is the complete removal of the existing roofing materials and the installation of new roofing materials over a clean substrate of furring, decking, or purlins. The applicable market consists of the residential sector and the commercial/industrial market. Residential buildings are typically high-slope, nonstructural roofing materials applied on a deck of furring or plywood. The commercial/industrial market is typically low slope with differing combinations of structural decking, insulation, and membranes or structural metal panels applied over open framing. Although the materials may look similar, the difference can be significant in several different ways (i.e., material type, material thickness, finish, structural spanning ability, and resistance to water intrusion). When it comes to market size, Chuck Howard, PE, president, Metal Roof Consultants, Cary, North Carolina, writes in the RCI magazine article, “Stretching your Retrofit Dollars with Metal Retrofit,” replacement and repair account for approximately 75 percent of all roofing work, with about 30 billion square feet of roofs requiring major repairs every year, according to industry sources. Photo courtesy of Drexel Metals, Inc. 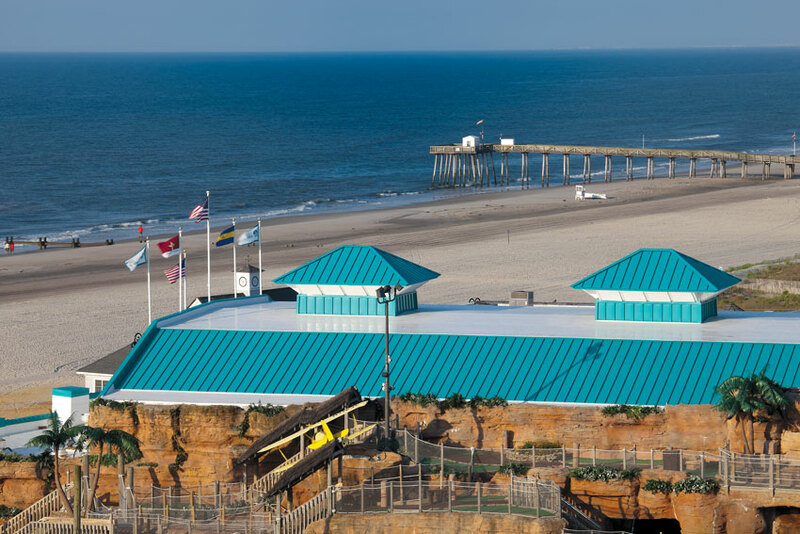 Bringing new life to the Ocean City boardwalk is a bright-blue metal roof retrofit for the Surf Mall in Ocean City, New Jersey. Furthermore, a national manufacturer of retrofit framing systems has identified one portion of the retrofit market—metal over metal—to be about 24 billion square feet of metal roofs ranging from 27 to 47 years old. Acknowledging the “very healthy market” for roofing retrofits, Mark Sullivan, AIA, LEED AP BD+C, NCARB, partner, Joshua Zinder Architecture + Design, Princeton, New Jersey, says this is especially true for buildings with historic status or with a desirable aesthetic that cannot be preserved without the continued use of metal roofs. In comparing retrofits and reroofing projects, each offers its own advantages and disadvantages. For starters, retrofits enable the original roof to remain in place to both protect the building interior during the installation and allow building operations to continue. This strategy is less expensive, less invasive, and can be typically done at any time of the year. Workers are afforded a safer work surface since they are walking on the old roofing, as compared to the open framing members like purlins and joists that workers must deal with when installing a new roof, explains Vincent E. Sagan, PE, senior staff engineer, Metal Building Manufacturers Association (MBMA), Cleveland. Furthermore, demolition waste and the need for a large laydown area for temporary storage of roofing materials is avoided. “Retrofit takes full advantage of the existing insulation with the option of easily adding more insulation over an existing roof,” he adds. Even uninsulated roofs still deliver an increased energy efficiency if the cavity between the old roof and bottom of the new metal roof is ventilated. In particular, above-sheathing ventilation (ASV) is recommended, and according to Oak Ridge National Laboratory research, it decreases heat gain through the roof assembly by as much as 30 percent in the summer and delivers a similar heat loss reduction in the winter. With the incorporation of a cool surface, this heat gain reduction can jump to as high as 45 percent. Another advantage with retrofits is that the through-fastened metal roof system diaphragm remains in place, thereby maintaining the original structural diaphragm strength used to design the original structure. Along these lines, building owners can also take advantage of retrofit systems to correct any existing roof geometry that may be causing problems with roof drainage. “Spending the money to remove the existing material to get to a good, sound substrate for the new installation [reroofing] might be the wiser choice in the long run,” Feth adds. With reroofing, the old metal roof can be recycled, design defects can be remedied, damaged insulation can be replaced, or new, higher R-value insulation can be added. Photos courtesy of Drexel Metals, Inc.
By tearing off the existing metal panels and salvaging the existing insulation and metal zee purlins for this roofing retrofit project at East Lake High School in Tarpon Springs, Florida, the project team recycled 575,000 pounds of steel from the existing roof panels and saved $60,000 in salvage cost. On average, older flat and sloped roofs only offer insulation values of R-6 and R-10, which is generally far below most locally adopted energy codes. In contrast, most building codes have minimum R-values of R-19 for metal roofing per ASHRAE 90.1 and the Federal Model Energy Code recommendations. With regards to meeting current wind and code requirements, there is much easier access to the existing structure if modifications need to be made. In many cases, the materials used for the reroofing/recover installation are lightweight, so structural modifications are frequently kept to a minimum or not needed at all to support the new roof. The largest potential problem with reroofing, however, is the reality that when the old roof is removed, the building is susceptible to water intrusion until the new roofing materials are installed. Minimizing this risk can substantially slow the process of reroofing since only small areas can be done at one time. Other issues can include larger laydown area, debris removal, and difficulty with equipment access.